Lucy's Quilts: Who woulda thunk it? As I suspected I couldn't stop working on this one once the broken dishes blocks were finished! Many of the BD blocks were so small I knew they needed to be put in groups so I got started with that project. 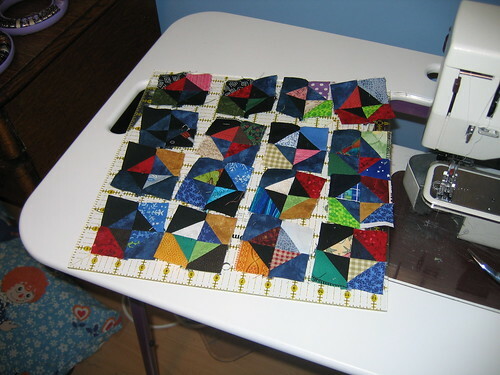 Here is one set of 16 blocks waiting to be sewn. Here are the groups I have put together so far. 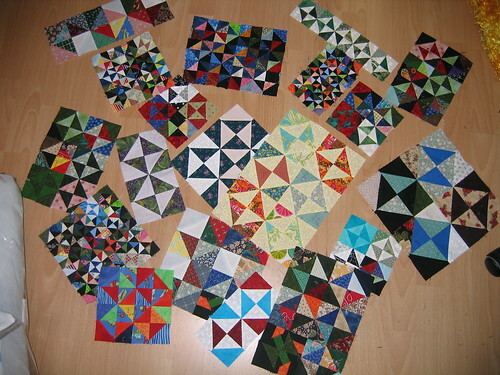 I am letting the number of blocks available in a size or the colorations to determine the size of the groups. Some are strips, some are square and some are rectangles. Not sure yet how it will all go together but I am having a fun Saturday morning working on this one while I listen to the sewing and quilting shows on PBS.